Modern content consumption is changing dramatically, driving a need for real-time content output and intelligent content repurposing and delivery. Does your content management system (CMS) deliver the necessary agility to help you keep pace with shifting customer, market and business needs? 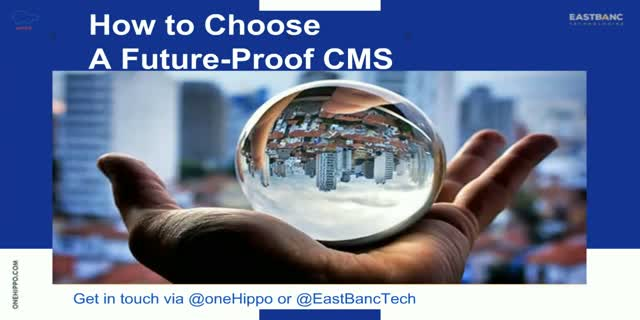 In addition, Mark Peerdeman of Hippo CMS will share a practical example of this by illustrating how Hippo future-proofs its CMS, including how Hippo thinks about the future of content management and a sneak peek at the Hippo product roadmap. Digital Commerce is in the hot seat at the moment, with retailers feeling the pressure of rising consumer expectations. The benchmark for a great digital commerce experience today is not "my last great commerce experience" but "my last great digital experience". It's a challenging battle, but it's also the reality of the digital landscape. After completing an extensive research project among global industry experts, we have found that there are several pressure points that nearly all digital commerce businesses are struggling with - and there are common solutions. In this webinar, we will cover the top 5 tips that we have uncovered for starting to address your digital commerce challenges right now. Join Ivo Bronsveld, author of the recent eBook, "The Digital Commerce Landscape: Trends, Challenges, and Opportunities", to uncover the latest insights and actionable steps for improving your digital commerce environments. Robert Rose, bestselling author and senior analyst at Digital Clarity Group, discusses the September 2016 Gartner Magic Quadrant for Web Content Management and its take on the evolution of owned web content. In this context, Rose gives insight into how brands can create a content strategy that drives multiple lines of value. In July 2016, Hippo released its latest version, which lies at the heart of its new cloud platform, Hippo onDemand. In this webinar, Hippo's Product Manager Adrian Collier will showcase the Hippo platform and discuss the technology that underlies our latest release and our new cloud-based service. In July, Hippo released V11 together with Hippo onDemand, our new cloud platform. In this webinar, Adrian Collier, Hippo's Product Manager, will cover everything that's different: all the ways in which we've improved the Hippo platform since our last release. This includes the features you will find in Hippo V11, as well as explaining our new cloud platform - and why we're so excited about it. Why content management is at the heart of the agile digital business revolution. Digital transformation is not about simply maintaining a digital presence for your company; it is an unavoidable business mandate for any enterprise that is not currently offering its customers the same level of personal, in-depth service online as it does face-to-face. It is not only customers that no longer have patience for poor digital experiences. It is entire industries, who are seeing digital force shifts in their business models, calling for new ways of working and entirely new approaches to communication. At the heart of this transformation lies a deceptively simple task: the management (i.e. creation, contextualized delivery, repurposing and organisation) of content. In this webinar, Robert Rose, Chief Strategy Officer at the Content Marketing Institute will discuss why content is the driver of robust digital experiences, and why finding a content solution is imperative for businesses facing the challenge digital transformation. Hippo's Director of Product Management, Mark Peerdeman, will then discuss some practical examples of how Hippo onDemand, which offers content management services in a revolutionary take on the cloud platform, offers businesses the agile, scalable content management engine that supports the digital transformation process from day zero. Improving Internal Communication Through Targeting and Personalization. Corporate intranet portals can be a major source of frustration for employees worldwide. Employee engagement, which crucial to employee retention and satisfaction, can often suffer when employees find themselves without a way to communicate with others in the organisation online - or when they are forced to do so through a clunky or malfunctioning system. In this webinar, Adrian Collier (Product Manager at Hippo CMS) and Nathan Nelson (Creative Designer at VASSIT) demonstrate how a web content management system can be implemented to enable employee engagement in the corporate digital workspace, and how Hippo's targeting and personalization capabilities can help companies deliver personalized content to foster employee retention and satisfaction. They will show a set of diverse real-life examples from the Dutch police force and LifeWorks. Today's consumers expect a great customer experience, always, and via all channels. Digital commerce has to take on this challenge and offer their customers the ultimate experience. - What does this trend mean for your content marketing? - How do you measure the success of your marketing efforts? - How do companies prepare for the (technological) future? This webinar, together with Hippo Partner Osudio, will not only get into theory but will show you many exciting example cases. The new Content REST API feature in Hippo 10.2 was created for front-end developers looking to expose content to a mobile app or a custom front end such as a digital kiosk or an IoT channel. It provides a great set of out-of-the-box features to kick-start the development of a mobile app, without the need for extensive back-end programming. In this webinar on May 11, you will get the chance to see how it works from the Hippo experts: Mark Peerdeman, Director of Product Management, and Platform Engineer Oscar Scholten. They will discuss the API's functionality in detail, explain how it fits into Hippo's multi-channel strategic product roadmap, and demonstrate how to easily develop an Angular application on top of this new API. Robert Rose, Chief Strategy Officer at the Content Marketing Institute and this year's keynote speaker at the Intelligent Content Conference, shares 4 key takeaways from the event. If content is king, intelligent content is the ace up your sleeve. Smart organizations are driving business impact through the application of intelligent content principles. Intelligent content is modular, structured, meta-data rich, reusable and format-free, which means you can deliver it to the right audience, in any channel, at any time. In this webinar Robert Rose covers best practices for intelligent content and shares how you can get started with managing content at speed and at scale. As businesses start to behave more like media companies, there emerges a seemingly overwhelming challenge: how to keep up. The only way we can keep up is if we start thinking about the structure of our digital content experiences so we can do the same. Who should attend: Digital Marketers, Content Strategists, IT decision makers and anyone interested in the vastly evolving marketing technology landscape. This webinar is brought to you by Hippo CMS and Kanban Solutions. Scrum master Henri van der Horst explains how a new communication platform for the Dutch Government was built on Hippo CMS to consolidate all of their communication streams and websites (including Rijksoverheid.nl and the Defense website), using an agile approach. This talk was filmed at Hippo's annual event Hippo.Connect in 2015. Want to know more about Hippo CMS? Hippo's Director of Product Management Mark Peerdeman explains why it is essential to have one central platform from which you can deliver content and gain insights across all your channels in order to create an optimised digital experience for your customers. He also demonstrates how Hippo CMS 10.2 makes this possible (and easier). Visit onehippo.com for more information and to try it out for yourself. Truly delivering on the promise of the online customer experience is about more than a feature or functionality -- it’s about agility, collaboration and an understanding of customer needs across the entire buyer’s journey. The right software can serve as a strategic partner helping enterprises stay ahead of the curve, but selecting the right tool can be an overwhelming task if you don't know how to parse through all the buzzwords and detail-dense descriptions. The Gartner Magic Quadrant is the go-to resource for an objective perspective on technology and gaining useful insights on WCM solutions. Discover how to read between the lines of this report with Robert Rose, Senior Analyst of the Digital Clarity Group, so you don't have to select your WCM solution in the dark. What does the future of digital marketing look like? The answer lies in removing barriers to online engagement. In this talk at filmed at the annual Hippo.Connect event, Coert Prins, Managing Director at Incentro, talks about Neuropersonalisation and three lessons that are essential for successful digital experiences for your visitors. Developing across platforms (e.g. both a website and an app) from the same code is a practice that offers many benefits and possibilities. In this talk filmed at the annual Hippo.Connect event, Peter Broekroelofs, CTO at Service2Media, presents a customer case study of doing just that, using Angular JS and Hippo CMS. When do you actually need continuous delivery capabilities? And how efficient can you really become given the right tools? In this talk at Hippo's annual Hippo.Connect event Jeroen Reijn talks about continuous delivery in a content centric world, in the context of DevOps culture and the CMS solutions landscape. As a quickly growing business with offices around the world and over 30 websites, Unit4 was struggling with a series of disjointed solutions that were creating inefficiencies and barriers to growth. 85% of people prefer to use apps over websites. For many businesses, hybrid apps are indispensable tools in delivering the best possible digital experience to their customers. In this talk at Hippo's annual Hippo.Connect event, Bart Waardenburg from Inceptor shares his firsthand experience as a front-end developer: why he believes hybrid apps are important and useful, and how the right CMS enables him to build them quickly, easily and enjoyably. What does creating a better customer experience look like from a developer's point of view? In this talk at Hippo's annual Hippo.Connect event, Jeroen Reijn talks about what it's really like to start with implementing in Hippo CMS as a developer. He discusses and demonstrates the tools and features that Hippo CMS offers to give more power to developers and support agile processes. When interaction with your brand is a crucial element of your business model, the importance of a positive digital experience for customers is amplified. In this talk at Hippo's annual Hippo.Connect event Ron de Milde, Program Director Communication for the Dutch national Police, discusses how the right CMS solution helps them to fight crime in real life. Hippo is on a mission to make the digital experience more personable for every visitor. We’re redefining the CMS space by engineering the world’s most advanced content performance platform, designed to help businesses understand their visitors – whether they are known or anonymous – and deliver the content they value in any context and on any device. Please enjoy all our live webinars and video's made available to you on this channel!